You are here: Home / News / Water wars continue: Will Brockton pay up? Water wars continue: Will Brockton pay up? This aerial photograph of East and West Monponsett ponds was taken by Halifax Police Chief Ted Broderick. It dramatically shows the harm drawing down water from the ponds has done. According to the law passed in 1964 to allow Brockton to take the Monponsett water as an “emergency measure”, Brockton must pay to maintain the ponds if they draw water from the ponds. 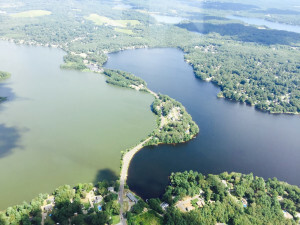 The City of Brockton has turned over some documents regarding its water diversion from the Monponsett ponds, according to Halifax Town Administrator Charlie Seelig, but as of press time he is not certain what exactly was released. This is in response to a formal public records request for, among other information, the water budget for the city. Halifax has made multiple requests to secure these documents. But the requests were ignored long before the formal public records request was sent, with notable regret, according to Seelig. This has angered Halifax officials as well as state officials such as Representative Thomas Calter who has threatened to take the matter to the Attorney Genera’sl office, according to Driden. The legislation clearly states that Brockton has a financial responsibility to maintain the Monponsett Ponds if they are diverting water from them. Seelig, if he did indeed receive the necessary documents, will be going through the budget attempting to reach out to Brockton to find the money from their water department in order to fund this mandate to maintain the Monponsett Ponds so that cash-strapped Halifax does not have to. According to both Seelig and Drinan this diversion, given that water levels are high enough, can happen anytime between October 1st to May 31st. The diversion reverses water flow by gravity across natural watersheds, and brings water from the stagnant and algae-ridden West Pond into the East Pond, which has suffered as well from both algae and invasive weeds, though to a lesser extent according to Seelig. The East Pond has been able to stay open all year, this year. Selectman Chairman Kim Roy has been very vocal about the Monponsett Pond “situation” for some time, and despite her anger, wants to work with Brockton officials to find a long-term solution to end the pollution caused by this practice, as do other Halifax Selectmen and Halifax officials.